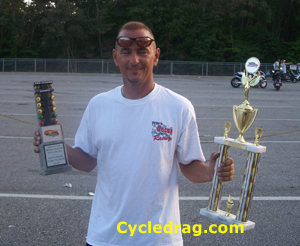 MIROCK Outlaw Pro Street racer Ronnie Procopio continued to build on his point lead by capturing his third win of season at the WPGC Bike Fest from Maryland International Raceway, July 19-20. 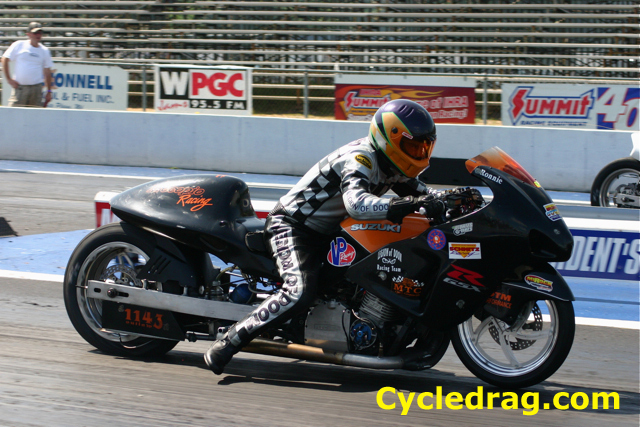 Procopio has been racing dragbikes for the last 14 years. He continues to achieve unprecedented success in bracket racing by garnering multiple event victories. The former Waldorf, Md. resident ha amassed a staggering six MIR track championships in the last decade-and-a-half. On average Procopio takes his bracket bike to a final at least once during a typical MIROCK weekend. Along with his win in Outlaw at the Bike Fest, Procopio finished runner-up in Quick 32. With three wins in Outlaw Pro Street in just five events this season Procopio, who is in only his second year in the category, is quickly proving to his adversaries that he is among the most elite riders. Procopio made the plunge into the heads-up class last year when his good friend and teammate Rob Hunnicutt turned him on to a L&W-built Outlaw machine being sold by Florida-based rider John Gatti. During Saturday’s qualifying Procopio landed the No. 2 spot with a best run of 7.23, just three hundredths behind pole-sitter and defending class champion Dave Norris’ 7.20. Procopio received a broke bye in round No. 1 when Brian Rich couldn’t make the run. He went on to post a 7.17 to gain lane choice in round No. 2. Procopio then advanced to the final by ousting Brian Owens with a 7.21 to Owens’ 7.74. In an exciting side-by-side final Procopio reached the finish line first with a 7.23 to Norris’ 7.25. Procopio later admitted that he nearly conceded the victory. In the winner’s circle Procopio reaffirmed how glad he was at his decision to stay in the gas. Ronnie’s wife, Robin Procopio, who is an active and successful racer herself, had nothing but praise for her husband.